I've been sewing. 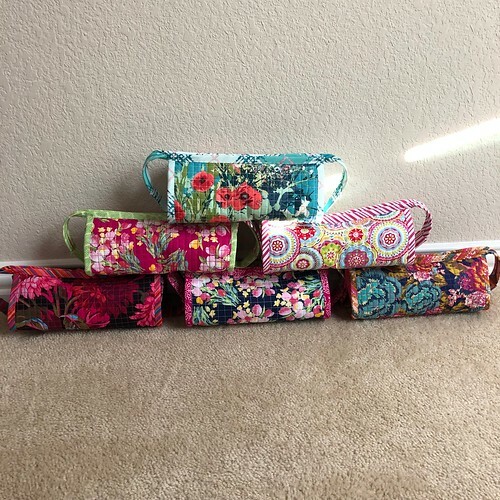 I made six Sew Together Bags this month, some for gifts, some for me. I heard about this pattern a few years ago, thought it was an amazing idea, bought it, downloaded it, and haven't done anything about it since then. Periodically I would sort through fabrics and try to decide what to put where, but I never really got anywhere. This year, I decided to make some for gifts and figured I'd make myself a couple as well, for a total of six. I sat down with my piles of fabrics and some post-it notes and figured out (and marked) what was what. 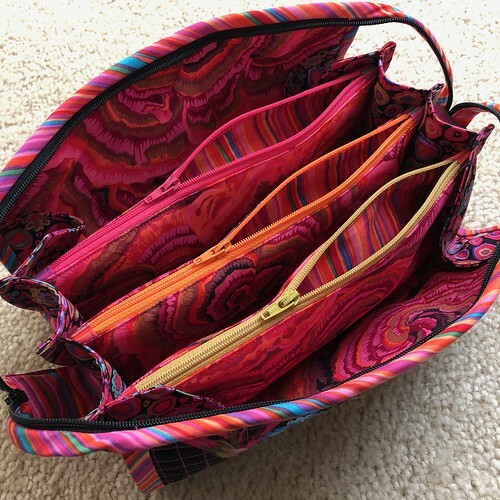 I had the pattern, the link to the sewalong, and an insane number of zippers (the company at that link sells a set of the long zipper and the three short zippers you need for this bag in your choice of colors - NAYY). I separated the fabrics and zippers for each bag into their own ziplock bags so I wouldn't get confused. 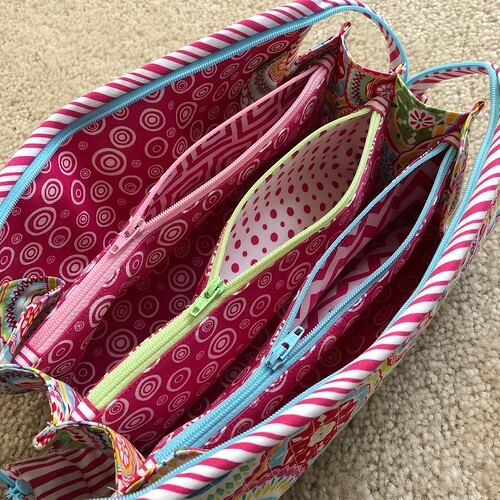 I realized I could sew three of the bags with white thread and three with hot pink thread. This meant I could use assembly line techniques and not have to change thread too often. 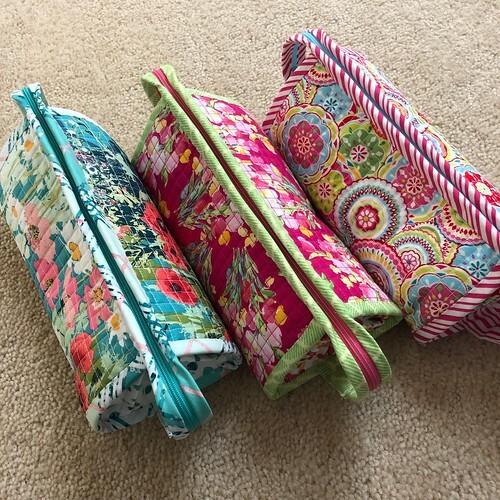 Some of the bags have the same fabric in each pocket lining, some only have one fabric. 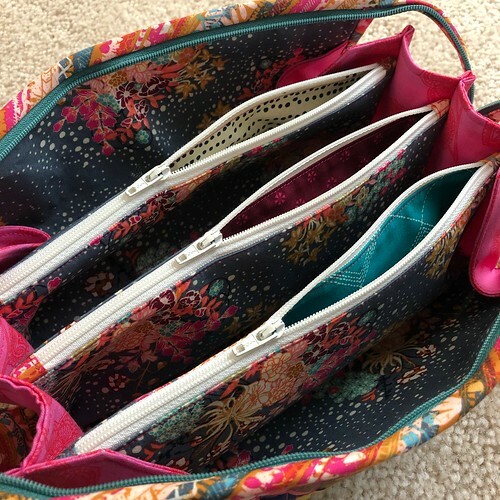 Some of the bags use different fabrics for the interior and exterior side panels while some bags just used one. Cutting out took an entire afternoon, but I stayed organized and kept each of the bag parts together. I quilted all of the exteriors with a 1cm grid (my sewing machine is a Pfaff - metric markings), and after trimming them down once they were quilted (quilting can make a piece of fabric draw in, so for projects like this, you cut your pieces bigger than necessary, quilt, and then trim down to the correct size as listed in the pattern), I was ready to go. I was also 12 hours into the project and hadn't even started the actual construction yet. I used a combination of the pattern directions and the sewalong directions to put the bags together. 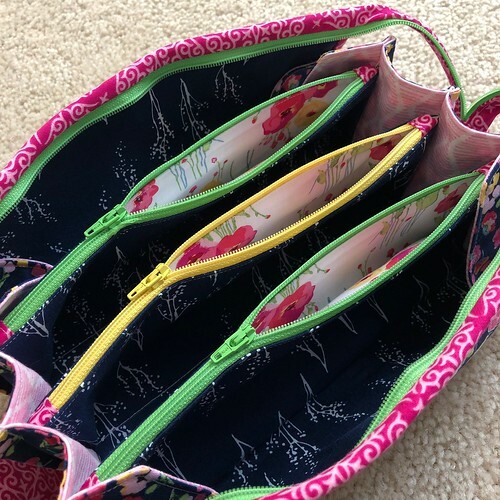 I also used this tutorial for zipper tabs on the interior pockets. I think it makes the zippers look neater and it reduces bulk as you sew it. When I did the binding, I sewed them on by machine first and then turned them over and stitched them down by hand to finish them. 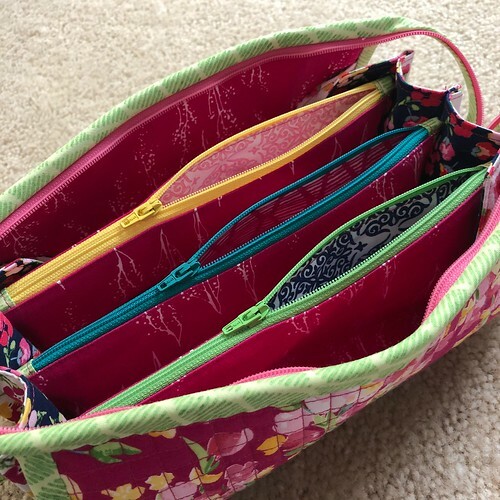 For the long, top zipper bindings, I only did hand stitching along the bag. I machine stitched both sides for the ends of the zippers where they make little handle loops. I felt like this would make them more secure. While this is definitely not a beginner pattern, I didn't think it was difficult either. There are some fiddly bits and being comfortable with your sewing machine makes it easier to get through these. Hope your New Year is amazing and I'll see you there! 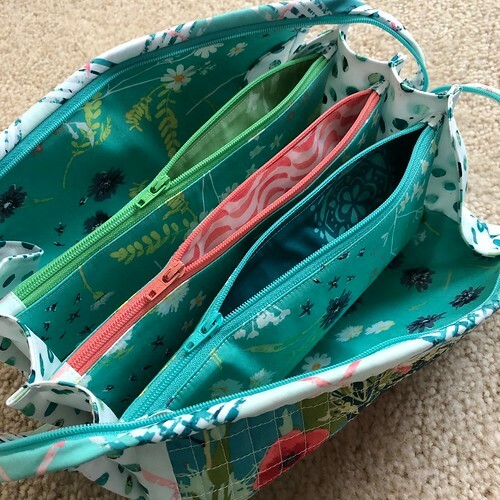 Your sew together bags are amazing! 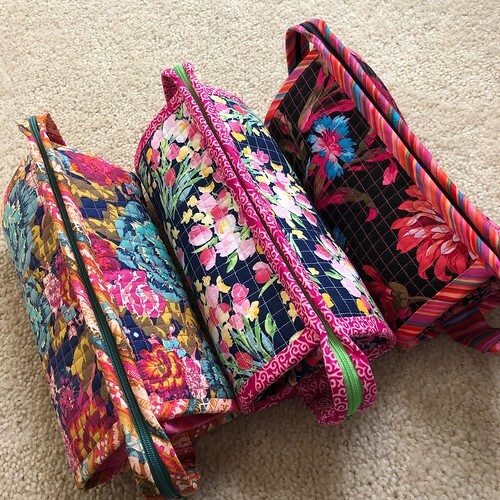 You have such an eye for color in your sewing and knitting. Wow! Each one of those is great in its own way! I love every combo. Kudos to your patience! Your recipients are lucky indeed.